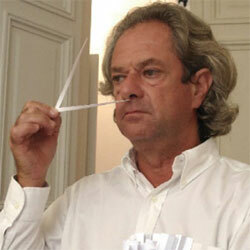 Michel Almairac is a perfumer working at Robertet. Born in 1953 in Grasse, France, the fragrance capital of the world, he continues to reside just off the coast of the French Riviera. In 1972 he attended the perfume school at Roure Betrand Dupont (currently part of Givaudan). Through the years Almairac worked for the fragrance companies Creations Aromatiques, Drom, and Takasago before joining Robertet in the late 1990s. He is recognized as one of the world's leading perfumers.